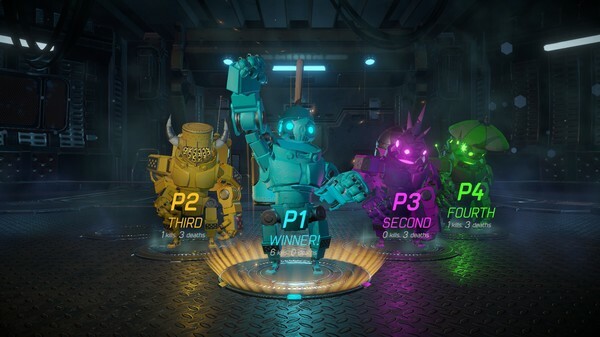 Award winning Kiwi smash brawler, Grabity, will be drawn into the orbit of Steam on May 31, Team Ninja Thumbs has announced. According to the Auckland studio, Grabity has players dance the tango of death in a fast-paced, physics-based arena starring combat robots with lethal gravity guns and curiously interchangeable heads. Translation: it’s a fast-paced, physics-based arena brawler wherein two-to-four players duke it out locally or online using gravity guns to turn nearby objects into lethal projectiles or makeshift shields in intense tactical throw-downs. What’s more, Grabity is being translated into Te Reo by Jack Potaka and Te Whainoa Te Wiata, with French, German and Portuguese versions also planned. “We love all the classic couch multiplayer games, and we want to deliver that same vibe with online play too,” said Grabity lead artist and co-designer Moritz Schlitter. Requiring both twitch reflexes and a tactical mindset, Grabity demands players outmanoeuvre and outwit their foes, turning gravity to their advantage, predicting the paths of both projectiles and rivals to secure a brutal hit while snatching their next crate in mid-air. Throughout the frenetic mêlée, the arena evolves kinetically as players smash, grab and loot their surroundings – jostling for the upper hand in a contest of aerial agility, dashing for pickups, hovering momentarily to nail the perfect trajectory and squabbling over the limited environmental ammo. Grabity won first place in Kiwi Game Starter 2016, and was awarded a place at the PAX Australia Indie Showcase in 2017. It was also a finalists at PlayByPlay and Chromacon that same year. You can read more about the creation of Grabity here.